Here's your chance to hobnob with Chicago's elite and entertain your guests in high style in Chicago's Lincoln Park. 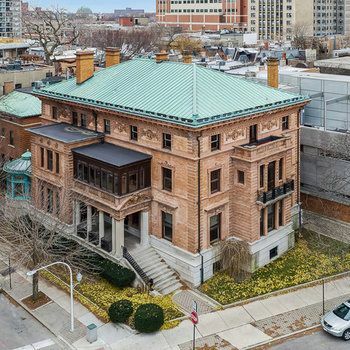 The Wrigley Mansion, as it is commonly known, is a 9 bedroom, six bathroom home that overlooks Lincoln Park and Lake Michigan. The 13,700 square foot mansion features a mahogany paneled library and a top floor ballroom where you can host your own murder mystery parties. The mansion has been on the NRHP since July 1980. Wrigley Mansion, Photo by chicagoist. For a cool $7.1 Million dollars, you too can live like a chewing gum magnate.